This Deep Seating Chair Set features both seat and back cushions stuffed with plush foam inside superior Sunbrella fabric. This set also comes with a handy coffee table, which makes for the perfect area to rest drinks, snacks, books, or magazines while enjoying your favourite outdoor seating area. Built from lightweight, rust-free aluminum. The Tacana Wicker Patio 4-Piece Deep Seating Set from Hampton Bay offers comfortable seating constructed of powder-coated, rust-resistant steel beneath hand-woven resin wicker in beautiful espresso. Perfect for entertaining, this set includes two stationary club chairs, a loveseat with cushions, 4 accent pillows for a pop of color and a faux wood coffee table. The set is perfect for indoor or outdoor entertaining, featuring weather-resistant fabric that's easy to clean. The Milan Sectional Sofa will become the most popular spot for casual living in your outdoor recreation room. The extra deep seating provides outstanding comfort for those special summer moments with family and friends. The set features rust-free all welded aluminum frames expertly hand woven with eco-friendly polyethylene all weather wicker which is fully recyclable. To complete the set, deep plush cushions are made from Genuine Sunbrella acrylic, the number one fabric for outdoor use. The Naples Deep Seating set features a sofa, 2 lounge chairs and a coffee table. It's the perfect place to relax with family and friends. The furniture features all welded aluminum frames that are expertly hand woven in eco friendly polyethylene all weather wicker that is fully recyclable. The coffee table features an aluminum slat top for durability. The plush, thick cushions offer extreme comfort and are made from genuine Sunbrella, the number one fabric for outdoors. The Oslo collection features clean, uncluttered lines that are so in vogue with today's top designers. Oslo also features mixed media, the hottest trenc in outdoor furnishings. The different materials, matte white finishing, honey coloured all weather wicker, authentic teak look resin wood and, of course, Sunbrella cushions perfectly coordinate to create a stunning ensemble. All frames are powder-coated aluminum so will never rust. The seating pieces are all welded so require no assembly. The tables, ship compactlky and are easily assembled with the tools provided. Create your personal oasis with the Oslo collection and enjoy outdoor living at its best. 4-Piece Patio Deep Seating Chair Set in Ruby This Deep Seating Chair Set features both seat and back cushions stuffed with plush foam inside superior Sunbrella fabric. 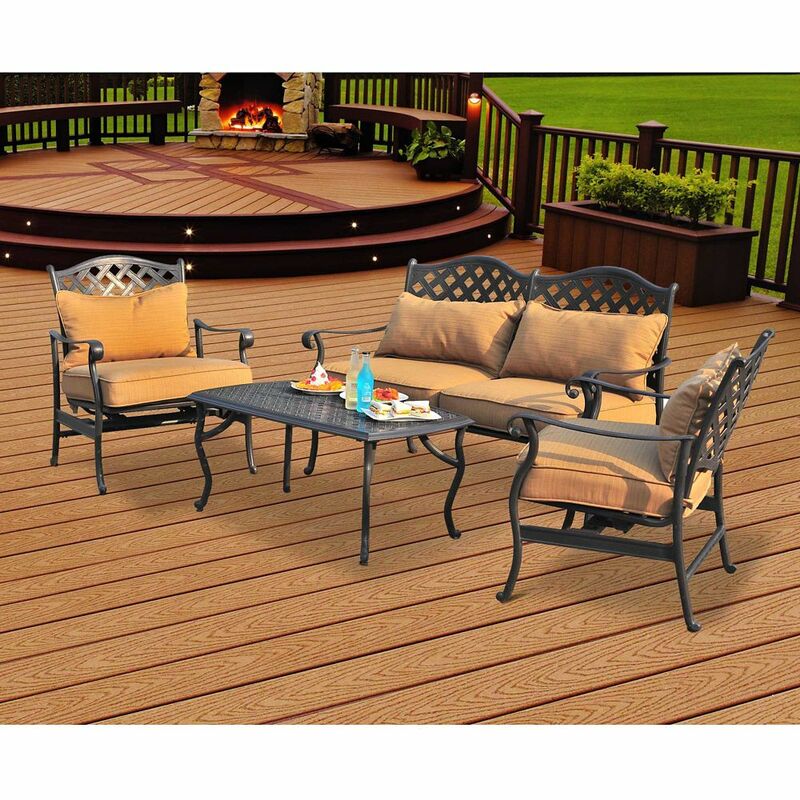 This set also comes with a handy coffee table, which makes for the perfect area to rest drinks, snacks, books, or magazines while enjoying your favourite outdoor seating area. Built from lightweight, rust-free aluminum.